Nothing compares to the taste of a tomato just picked from the vine. Gardening is a fun and satisfying physical activity that gives you access to fresh, affordable produce. 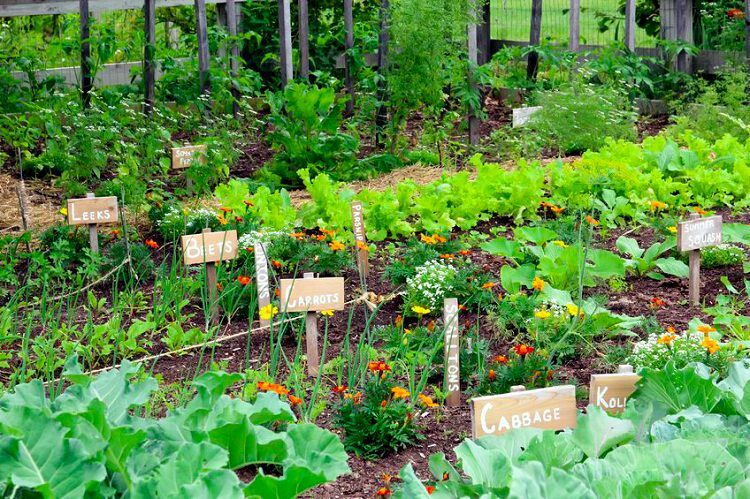 Here are a few easy steps to get started with gardening and growing your own nutritious food. 1. Know what grows. When buying plants, ask which varieties will do best in the conditions you have work with. Some plants need lots of sun while others tolerate shade. In general, tomatoes, cucumbers, peppers, peas, beans, corn and squash require six to eight hours of direct sunlight each day. Carrots, radishes, beets and other root vegetables benefit from at least three to four hours of direct sunlight. Leafy greens and lettuce can tolerate shade. 2. Be sure that you have the right soil conditions. The soil should be well draining and loose rather than clay soil or too sandy. Remove rocks and use a tiller to loosen the soil to a depth of at least 8 inches. In addition, vegetables need organic material, such as compost or manure, to provide nutrients the plants need to thrive. Plants also need nitrogen, phosphorus and potassium, which you can get in a fertilizer. If you don’t have good soil, consider building a raised bed. 3. Consider container gardening. If you have limited space or poor soil conditions, you can grow vegetables in barrels or buckets. Finding a container with adequate drainage is key. If the container doesn’t have holes in it, make a few half-inch holes near the bottom to allow water to run out in order to keep the plant roots from rotting. 4. Go herbal. Herbs are one of the easiest plants to grow and are a good place to start. Choose a few varieties, such as parsley, basil and rosemary. Don’t worry if you end up with too much by the end of the summer. Basil can be used to make pesto, and all herbs can be dried. 5. Start small. You don’t have to grow an extravagant garden right away. Start with a few vegetables that are easy to grow, such as cherry tomatoes, green beans or sugar snap peas. You can either use seed packets or starter plants from your greenhouse. 6. Protect your plants. You may have to put up a chicken wire fence to keep out the rabbits and deer. They love to eat vegetables! 7. Care for your garden. Water your garden regularly. Vegetable gardens need about 1 inch of water per week during cooler weather and two to three inches during peak growing stages. In addition, weed regularly because weeds harbor insects and disease and can crowd out your vegetables. Get rid of rotting or dead vegetation because they can also be a haven for pests. 8. Harvest your garden. Pick vegetables as soon as they are ripe and enjoy your delicious produce. 9. Enjoy gardening year-round. Gardening doesn’t have to end after the harvest. You can have fun looking at seed catalogs during cold winter months and start planning what to plant in the spring. You can even buy an indoor grow light to start growing tomato, bean and squash plants early in the spring. 10. Involve your kids. Research shows that kids who live in a home with a garden eat significantly more vegetables than those without access to a home garden. Gardening helps kids to engage their curiosity, learn to be resourceful and gain self-confidence. It is a great family activity that promotes physical activity. Growing a garden is a wonderful way to eat local foods, save money, and promote a healthy diet. No matter what you plant, gardening is a fun way to get outside and enjoy the fresh air! Protecting plants has been a huge issue for me. Squirrels and rabbits. They have eaten a lot this year, but I keep trying!